Los Angeles, Wolfsburg- November 2014- Volkswagen started in 2005 the development on Hydrogen Fuel Cell Vehicle as an alternative to Fossile fuel. At 2014 Los Angeles Motor Show Volkswagen introduced the Golf HyMotion Sportwagen based on current Golf model. 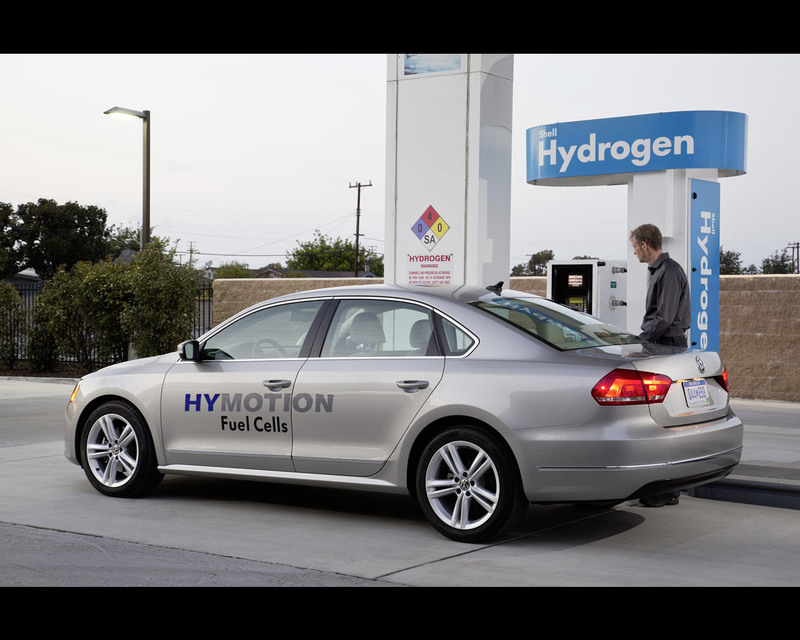 At the same time US Passat HyMotion are being tested in California with the same Hydrogen Fuel Cell System. Unlike many of its competitors, Volkswagen is following the strategy of implementing its alternative drives in high-volume production vehicles. Within the same philosophy in the same Volkswagen Group, Audi introduced the Audi A7 Sportback h-Tron. Layout and functional overview. 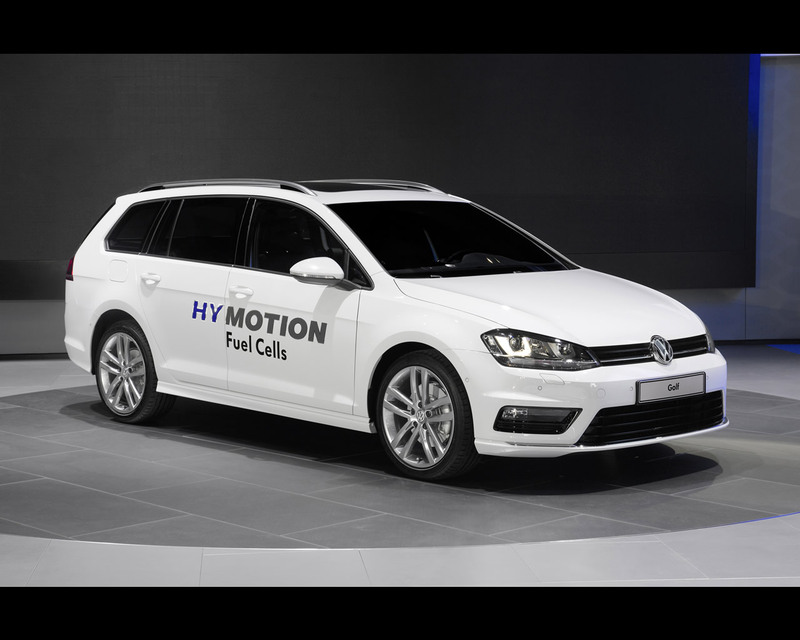 Volkswagen Group Research is utilizing the company's fourth-generation fuel cell in the Golf SportWagen HyMotion – and simultaneously in a research vehicle based on the US-version Passat. Group brand Audi is also presenting the same fuel cell at the Los Angeles Auto Show in an A7 model. 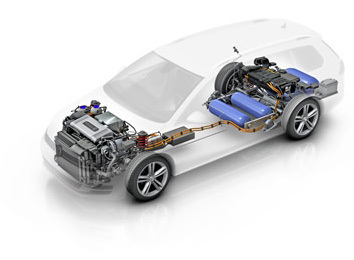 All three fuel cells are based on the LT PEM fuel cell stack developed in Germany. LT stands for the type of fuel cell: Low Temperature. PEM stands for Proton Exchange Membrane. The key element of each individual fuel cell – many of which are combined to form a stack – is the proton-conducting membrane (PEM). Each membrane is located between an anode and a cathode in the fuel cell. Hydrogen flows into the cell at the anode end, and oxygen at the cathode end. The hydrogen and oxygen react and combine to form water at the cathode end. Energy is released in this process. Process details between anode and cathode. At the anode, the hydrogen is split into electrons and protons. The positively charged protons "migrate" through the membrane to the cathode. The negatively charged electrons flow to the cathode via the external electrical circuit. This flow of electrical current supplies electrical energy. At the cathode, the protons react with the inflowing oxygen and the electrons to produce "process water", most of which escapes via the exhaust system. Around sixty percent of the energy input in the form of hydrogen is converted to electricity. The fuel cell converts the chemical energy of an oxidation process directly into electrical energy; this oxidation process is also known as "cold combustion". The "exhaust gas" is nothing other than clean water vapor. Volkswagen HyMotion-a progressive research vehicle with a fuel cell drive. As the power source of the future, hydrogen and oxygen are combined in the fuel cell to form pure water. Energy is released in this "cold combustion" process – drive energy for an electric motor that turns with zero emissions. The front wheel drive Golf SportWagen HyMotion accelerates to 62 mph in 10.0 seconds. The hydrogen is stored safely in four high-tech carbon-fiber tanks, which are located in a space-saving way in the underbody. Their fuel capacity enables a driving range of 310 miles. Refilling of the fuel tank of the concept car takes just three minutes. The key drive components of the Golf SportWagen HyMotion were developed by Volkswagen Group Research in Germany. 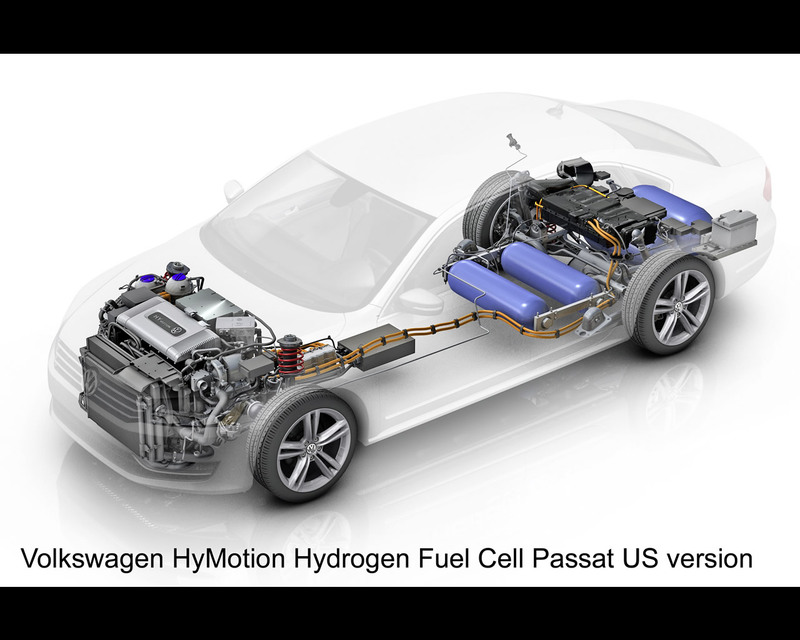 The fuel cell system, which has a driving power of 100 kW, was conceptualized at the Volkswagen Technology Center for Electric Traction. In addition, the concept car has a high-voltage lithium-ion battery, which stores the kinetic energy recovered from regenerative braking, assists in the starting phase of the fuel cell and adds a dynamic boost to the maximum acceleration of the Golf SportWagen. The fuel cell and battery drive an electric motor adapted from the e-Golf. The mechanical design for this innovative car build is based on the modular transverse matrix (MQB) which was developed by Volkswagen and is used throughout the Group. Thanks to use of the MQB, the current Golf hatchback versions and the new Golf SportWagen have advanced to become the world's first vehicle model series that can host all conceivable drive types. Today, the Golf is already offered with gasoline engines (TSI), diesel engines (TDI), a natural gas drive (TGI)1, an electric drive (e-Golf)2 and a plug-in hybrid drive (Golf GTE)3. No other car offers such a variety of drive types. 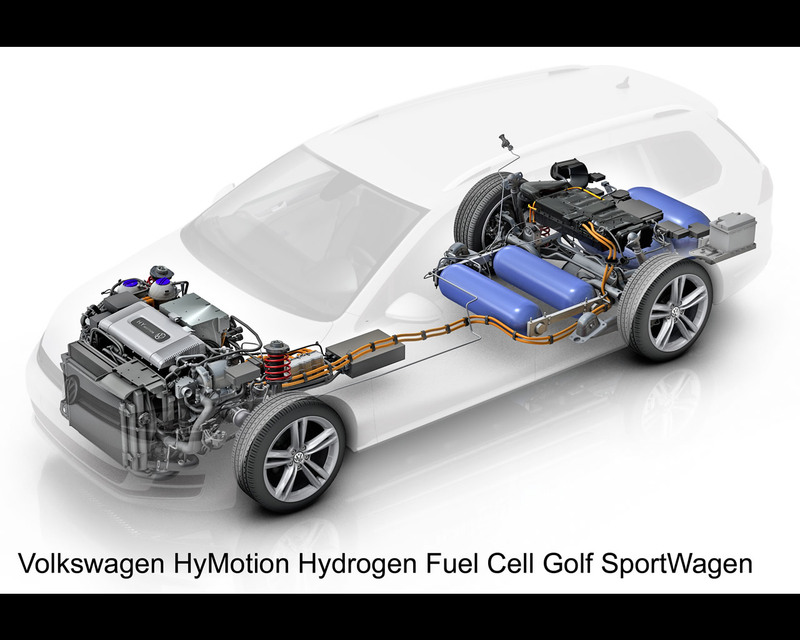 Volkswagen is showing the Golf SportWagen HyMotion to demonstrate for the first time how a hydrogen fuel cell could be implemented based on the MQB as soon as research and development work has been completed and a solution could be developed whose price would be acceptable to new car buyers. Before the market launch, a hydrogen infrastructure must first be created. This means not only a broad network of hydrogen fuel stations, but also the production of the hydrogen itself. Because hydrogen only makes sense as a source of drive energy if the primary energy used to produce it comes from renewable energy sources. Unlike many of its competitors, Volkswagen is following the strategy of implementing its alternative drives in high-volume production vehicles. That is, precisely as the all-electric e-Golf and the Golf GTE that is equipped with a plug-in hybrid drive, future fuel cell drives would also be integrated into a production model that has everyday practicality, has been optimally engineered and is offered at an attractive price. It was with this objective in mind that several research vehicles were built based on the American Passat, in which the same drive components are used as in the Golf SportWagen HyMotion. 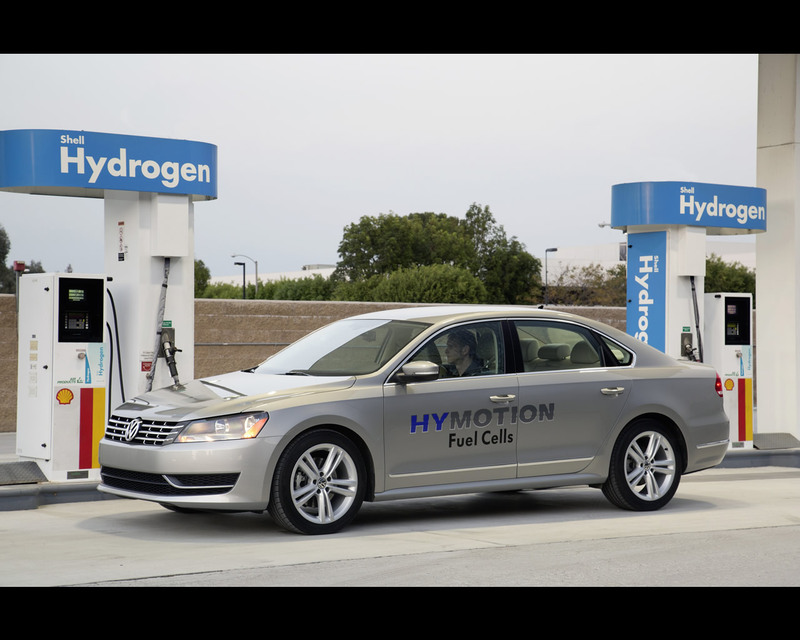 The fleet of Passat HyMotion vehicles is currently being tested on the streets of California. 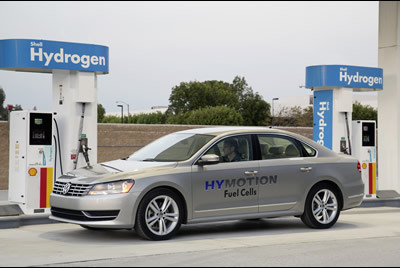 The first Volkswagen hydrogen fuel cell vehicle experiment was started in 2005 with two Volkswagen Touran Hymotion. Two Touran HyMotion vehicles were participating in the fourth CaFCP Road Rally. 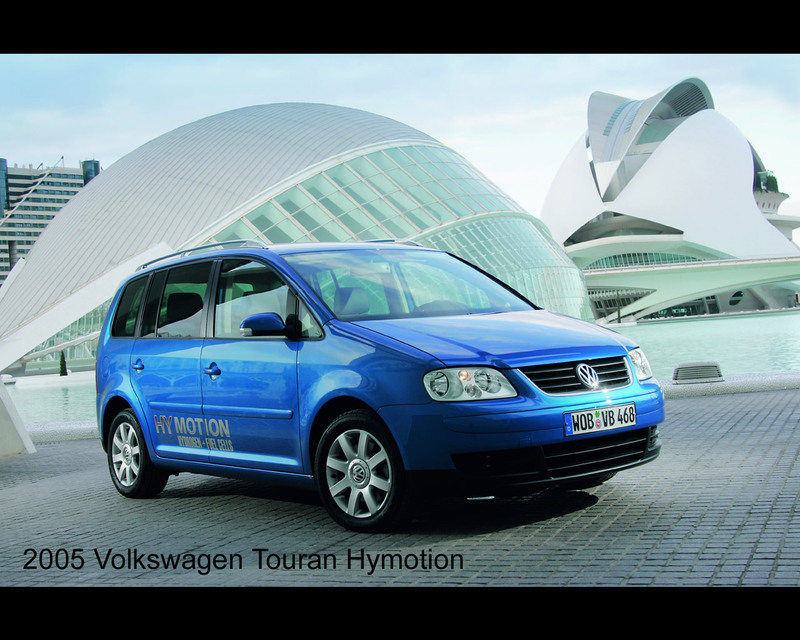 Both Touran HyMotion vehicles are equipped with the 80 kW electric engine powered by fuel cells. The press, politicians, the government, environmental groups as well as members of student organisations had the opportunity to become familiar with the vehicles and their emissions-free technology during test drives.